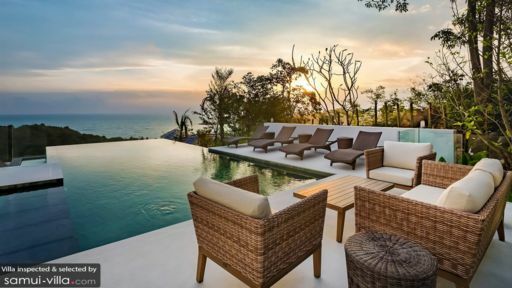 Villa Hruhra is a stunning luxury villa in Koh Samui near the coastline of Choeng Mon beach. 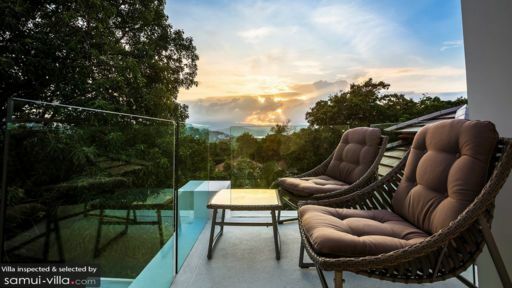 The villa provides guests with panoramic views of the ocean and outlying islands and at the same time delivers the best in tropical modern living. With pristine white interiors complemented by abundant nature around, Villa Hruhra is an idyllic home for your next tropical getaway. It is located over three floors with modern spaces including three bedrooms, a lavish infinity swimming pool, outdoor dining and contemporary living area. Guests of all ages will find the villa to be wonderful and comfortable. You have three luxurious bedrooms at your private villa that lend majestic backdrops that you can enjoy while relaxing on your king-sized beds. You can request for twin beds as well as per your needs. The white interiors work well with the blue skies and ocean beyond. You will find the bedrooms equipped with walk-in closets, air-conditioning, futuristic ceiling fans and flat-screen TV with international channels. There are gallery walls with monochromatic photography, black-out curtains if you wish to sleep in and adjoining terrace with seating. Ensuite bathrooms are equipped with double vanities, spacious freestanding bathtubs and ocean views. Two of the bedrooms are separated only by a door so you can make this work as a family suite as well. From the moment that you step inside the antique wooden doors, you are greeted by the looming façade of Villa Hruhra and the tropical gardens in front. Landscape with trimmed hedges that frame the individual rooms at the villa, the outdoors is absolutely astounding. You have an infinity swimming pool with sweeping ocean views, a poolside lounge area with fiery fire pits and an entire section dedicated to a BBQ grill and alfresco dining. Make the most of these verdant surroundings by spending time outside amidst the fresh, tropical breeze. Villa Hruhra is designed with a gracious living area that is located right off the swimming pool. Featuring all-glass walls and glass doors, this indoor space blends seamlessly with the outdoors for a charming tropical vibe. Pristine white walls are decorated with a singular art-piece for an elegant touch. A massive ten-seater sectional and ottoman is in the living area facing the ocean view. The centrally, air-conditioned living space can function as an extension of the outdoors or an enclosed room for a more intimate time. The centre of the living area is occupied by the indoor dining area that features an eight-seater dining table with a washed-out wooden finish in white. No additional colours smear the spotless interiors. To the far right stands the modern kitchen with a luxe breakfast bar, high seating, and state of the art appliances. Since the villa is part of Horizon Estate, there are many amenities offered by the estate that guests can avail including the fitness centre. The estate is guarded round the clock for your safety and maintenance and upkeep is provided regularly. If you wish, you can request for a private chef or rent a car by telling the staff in advance as these are charged additionally. 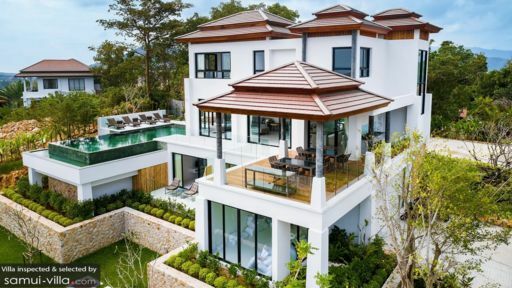 Villa Hruhra is less than a kilometre away from Choeng Mon beach thus, giving you full access to its white, sandy shores and the ocean water. Relish a bite to eat at a nearby café or a restaurant, get a massage at Eranda Herbal Spa, visit the Big Buddha Bophut and enjoy adventure activities at Treetop Zipline close to Chaweng Beach. For drinks and sunsets, head on over to the beach clubs like [email protected] and Green Mango Club.